Here are a few links to help the students in the Mountaineers Spring Sailing Crew Class that I helped teach. These links are also good starting point for any recreational boater. Links are provided to Nav. Problems, handouts, additional information on charts, PowerPoint presentations and additional practice problems and resources for recreational boaters. U.S. Aids to Navigation – An introduction to the U.S. Aids to Navigation System with pictures showing the Aids to Navigation (ATON’s) and chart sections showing how the ATON’s are appear on the chart. The ATON’s and charts are from the Seattle and Puget Sound area. Marine Sound Signals – An introduction to common Marine Sound Signals used in the Puget Sound Area. 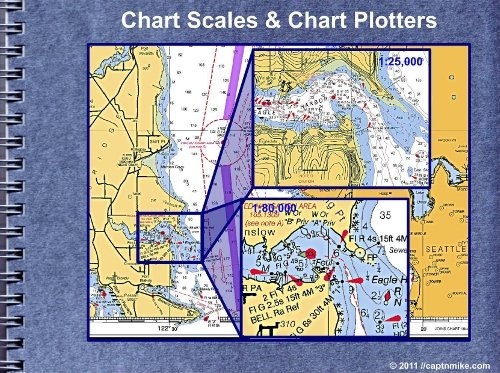 Introduction-to-Marine-Charts-Part 1 – A short introduction on how to read a marine chart, how to choose the proper marine chart for safe boating, including how to choose the proper scale, a few hints and tips on what to look for on a chart and some often overlooked tidbits that will help make your boating safer and easier. Personal Boating Safety Equipment – Equipment that many people carry on their person while boating. What is Boating Safety?? – A few thoughts on Boating Safety & a safe attitude in general. Hypothermia – Symptoms and treatment, also click through the link to the Cold Water Boot Camp to see what happens in water temperatures similar to what is seen in Puget Sound. Boating Etiquette – Tips on how to behave on a boat. Distress Signals – A quick overview. VHF Marine Radio Tips – Basic how to use a marine VHF, includes the phonetic alphabet and a two page printer friendly version you can take with you on a boat. Crew Tips from George – Valuable tips from a sailing veteran. Man Overboard! / Skipper Overboard! 30 knot winds, 35 / 40 knot puffs, a Hard Knockdown, Jammed Lines and the Skipper Overboard! A first hand account of a skipper going overboard in Puget Sound. Nav Rules / Marine Rules of the Road Quick Overview of the Navigation Rules with self test. World famous one page executive summery of the Rules of the Road. Quick Overview of Marine Charts – A quick executive summery. Boating Safety Handouts Student Handouts from Classes I Have Taught. Important Seattle Area Boating Information – Local notes including speed zones. How to tie a Bowline with your left hand – Updated – Help tying the Bowline for left handed people. How to Tie Your Boat to a Dock that has a Bull Rail – Part 1 – When there is a Bull Rail on the dock but no cleat to tie to. Chart 18446 Lab Exercise – Crew Class–Part 1 – Chart familiarization Lab Exercise. This is the Lab Exercise worked in the 2013 Crew Class. Crew Course Navigation Exercise 1 – Some typical navigation questions for recreational boaters. Navigation Exercise 2 – More typical navigation problems for the recreational boater. Mountaineers Sailing Crew Class Navigation Exercise – The lab handout from the second class session. Thanks for supporting Boating Safety. This entry was posted in Boating Safety, Mountaineers Sailing, Sailing and Boating Skills and tagged boating skills, crew skills. Bookmark the permalink. thanks for your help with my blog questions, i love your pictures, is it an option to share them?, are the boating pictures from one city or various? congrats on being interviewed by a magazine, i do free lance research for people who need prompts for their articles, nice to meet you, focused fox. your tags are exemplary, why don’t you advise others about tags? Thanks for you forum questions help. Your blog looks great and I’m forwarding your page to my Sailing friend in Canada. She would probably love to see your blog.